As a member of the British parliament in 1999, Sir Peter Tapsell, who passed away this past August, argued vigorously to keep the government from selling off over half of the country’s gold reserves. Previously, in the 1980s, Tapsell had managed a gold bullion fund, “valued at many hundreds of millions of dollars for the Sultan of Brunei, Sir Omar Saifuddin” – at the time one of the single largest private gold hoards on Earth. Though his argument before the House of Commons failed to stop the sales, it goes down as one of the most eloquent appeals ever made on the merits of gold ownership for nation states and individuals alike. 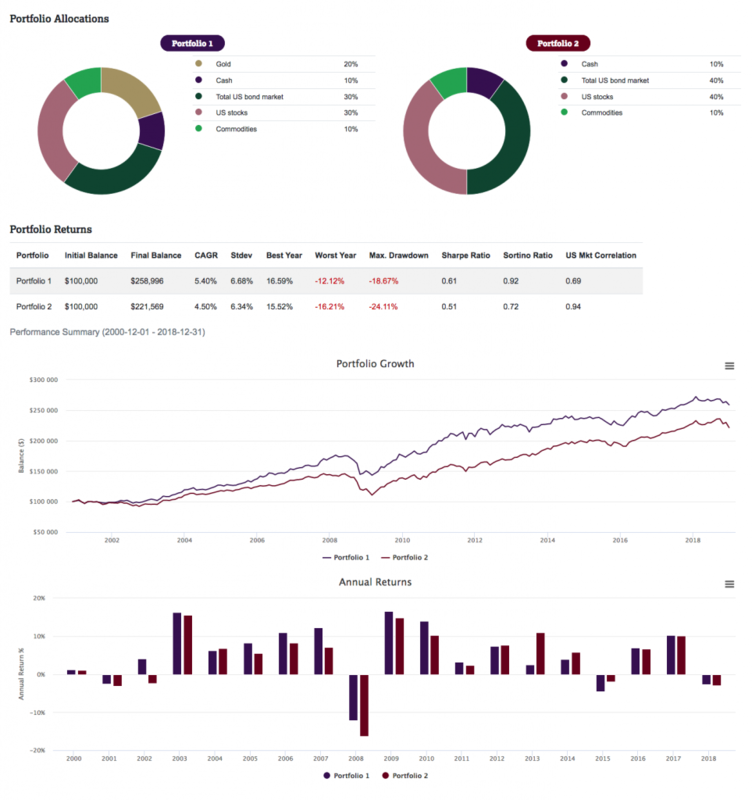 The study below, constructed utilizing some unique software at the World Gold Council’s website, compares two hypothetical portfolios making a $100,000 investment – one consisting of stocks, bonds and commodities diversified 20% with gold; the other consisting of stocks, bonds and commodities without the benefit of a gold diversification. We chose the year 2000 as a starting point in order to capture both bull and bear markets for the assets included. Today, “Portfolio 1” diversified with gold would be worth $258,996. “Portfolio 2” without the gold diversification would be worth $221,568. Please keep in mind that the current valuations are fixed at what many believe to be cyclical lows for gold and cyclical highs for stocks. Remarkably, Tapsell alluded to a time when the United Kingdom might need its gold and it would be sorry it had ever parted with it. “Gold is also the asset of last resort,” he said. “Although it is needed in good times, it can be vital when times are difficult. The last sale of gold in France was in 1969 to deal with the financial consequences of the May 1968 uprising. In Portugal gold was last sold following the 1975 revolution. More recently, in 1991 India used its gold reserves to borrow $1 billion to avoid default.” With Brexit and all its uncertainties looming, what would Britain give today to have its gold back at four times the price at which it was sold? We would like to thank the United Kingdom Parliamentary Archives for permission to quote Sir Peter Tapsell speech before the House of Commons which contains Parliamentary information licensed under the Open Parliament Licence v3.0. World Gold Council results are hypothetical, use total return and assume that all dividends and distributions are reinvested. Taxes and transaction fees are not included. Past performance is not a guarantee of future returns. Data and other errors may exist.